You can use software to tether your camera to a computer and use software like Helicon Remote and Helicon focus to create such images. In the field however, this computer and camera combination may not be practical. If you have a Canon DSLR camera that supports Live Viiew you are in luck. The Promote Control provides focus stacking functionality in a small unit (5 by 2.5 inch unit that is a little over 1 inch thick. It weighs 5.5 ounces). 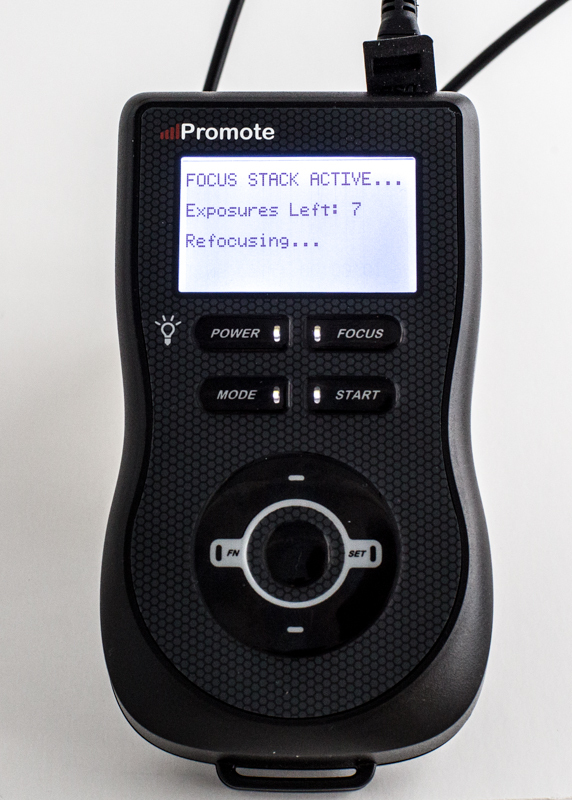 Using the “Mode” key, set the Promote Control to the “Focus Stacking” mode. Using the supplied USB cable connect your camera to the Promote Control. You do not need the Shutter cable for focus stacking. Once the connection is established, turn on your camera. Set the camera and lens to autofocus. Do not use AI Servo or AI Focus. On the Promote Control change the “Step” setting from “None/Reset” to “Small”. Medium and Large steps are also available and you will need to test which one is most suitable for the scene you are capturing. The focal length of the lens is also a factor that needs to be considered. Set the aperture to the desired setting – it is better to use wider apertures and high shutter speeds rather than narrow apertures. The stack will address the depth-of-field that you wish to obtain. Use the manual focusing ring of your lens to focus on the near point of focus in your scene. This will be the starting point of your focus stack. The first number indicates beginning of the focus stacking, while the second number indicates the end. Using the “Up” and “Down” keys on the face of the Promote Control, drive the lens focusing mechanism so as to get to the place in the scene where you want the focus stack to end. The “Frames” setting is a calculated value that shows how many images will be taken based on the step value and the lens travel from the beginning point to the end point of focus. You have the option to reduce the number of frames if you feel that the resulting focus stacking sequence will be too gradual. The number of “Frames” can be adjusted by selecting the reading and changed using the “Up” and “Down” keys. You will need to return to the “Focus Stacking” mode before pressing “Start” to capture the sequence of images. 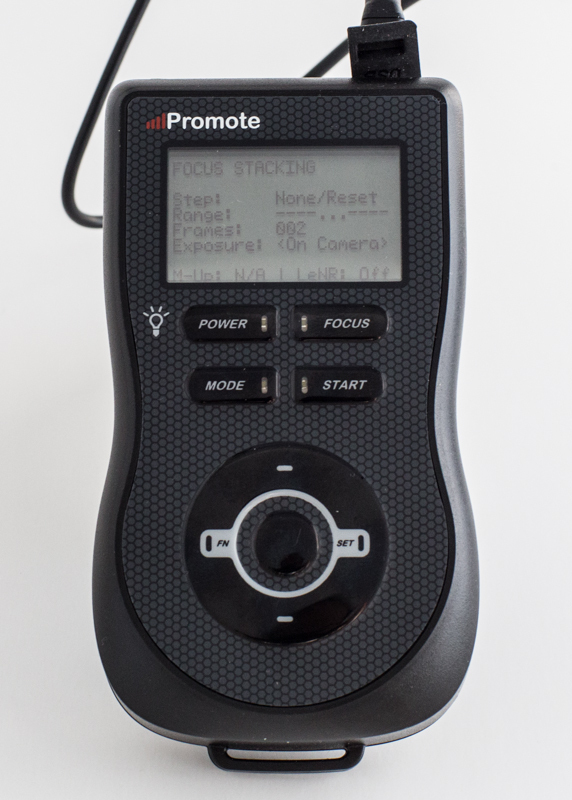 The Promote Control will retract your lens to focus on the starting point of focus in your scene, take an image and step the nest point. This process will continue till all the frames have been captured. You can then bring the sequence of images to be stacked and merged into a single frame using one of many software applications. Change “Step” to “none/Reset” and then repeat the set-up process from the beginning. Not following this will result is a poor sequence of images that will not stack to your satisfaction. 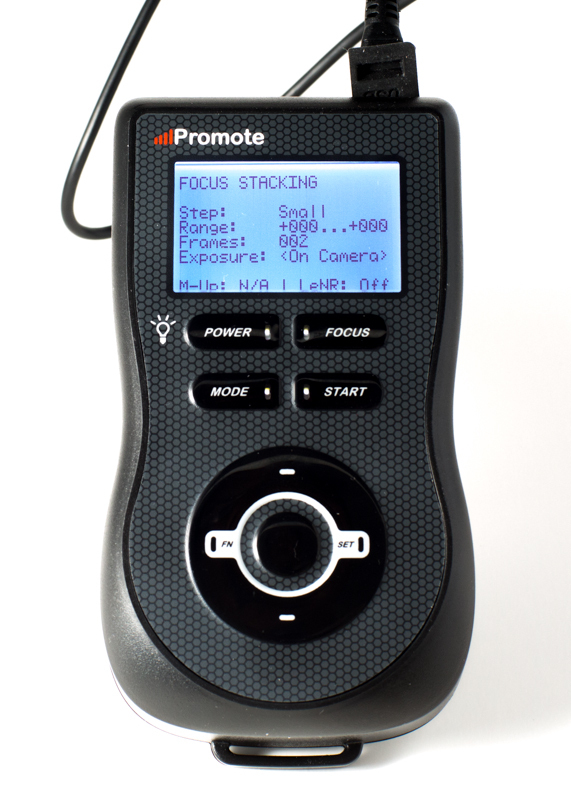 If you change your “Step” size setting on the Promote Control after establishing the focusing range, the focus range settings will revert to +000…+000 and you will have to repeat the set-up from the beginning.